Ideal for romance...be in love! The Jasmine blossom produces one of the most heady aromas on earth. There are over 100 constituents in Jasmine Absolute Oil, making it one of the most complex of oils. there's no aroma like it - and Jasmine is said to have a profound effect on the nervous system, making it beneficial for depression and nervous disorders. 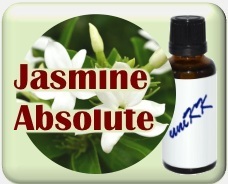 Jasmine absolute has an intensely rich, sweet, warm, floral scent with a tea-like undertone. The color is a darker shade of orange to brownish. It is produced by alcohol extraction through the concrete from the Jasmine Flowers. Jasmine is only available as an absolute. There is no distilled essential oil. Jasmine is well-known for its ability to promote a sense of optimism and well-being. The exotic aroma of a jasmine flowers can be relied upon to evoke a romantic mood. To make your own massage oil add 10 - 15 drops of jasmine oil to several ounces of sweet almond oil. Jasmine can get help to rid of physical, mental, emotional and even spiritual ills through the use of this aromatic essential oils. Essential oils are metabolized by the body like any other nutrients. Certain components within the oils will stimulate the immune system, destroy bacteria, act as powerful antioxidants and building blocks to improve nutrient absorption. It takes up to 20 minutes for the oils to be absorbed by the body, where they remain for 7 hours or more, before being excreted. Smell plays an important role in the process. Vaporizing (eg. using Aromatherapy Electric Vaporizer) essential oils produces the vapor; the smell and odor is transferred into a nerve message. The message is sent to different parts of the brain where the process of stimulating different hormones is undertaken. Renowned for women's problems, jasmine can be a valuable aid in the treatment of uterine disorders, for pain relief during labor, menstrual concerns, balancing hormones and milk production. Particularly useful for the respiratory system, try jasmine to calm coughs, ease laryngitis and hoarseness. Its painkilling and relaxing properties can help with muscle spasms and loosen stiff limbs. It may also stimulate the appetite. Jasmine is a luxurious and highly effective oil for all skin types, especially dry and oily, irritated, or suffering from dermatitis or eczema. Blend it with mandarin to increase elasticity and soften stretch marks and scars. Sensual blending suggestions: While jasmine is an exquisite perfume by itself, it combines beautifully with many other essential oils, including rose, neroli, sandalwood, orange, cypress, bergamot, frankincense, geranium, mandarin and rosewood. Add this precious oil to your bath products and skin care lotions, and create a delectable massage oil for yourself or someone special. You can also add 5 drops to your bath water to enjoy the dip. Enhance your beauty products - combine 3 to 6 drops into your shampoo, conditioner, face cream or body lotion. Essential safety precautions: The potency of undiluted jasmine is very strong, almost overpowering. Its powerful aroma indicates a low dosage is required. Too much may impede your concentration or disturb bodily fluids, e.g. catarrh. Over-use will diminish its effectiveness. In rare instances jasmine may be sensitizing to sensitive or problem skin. Now, you can enjoy fabulous Jasmine Sambac Absolute 100% Pure Essential Oil from Singapore Essential Oil Supplier, uniKK & uniCC, a husband (CC) and wife (KK) team. Our lives is made up by the CHOICES we made. Being partner to our home-based business allows us effective and efficient time management, focusing on Family needs, building Strong relationship in our marriage, and working together on the financial needs of the family. Also, it allows us to facilitate TMC (The Marriage Course) to enhance marriages. Couples with marriage problems have benefited from attending the 9 weeks course, followed by a testimony session to proclaim victory and progress on improving their Marriage Relationship. Those whose marriage relationships are good have feedback it takes them to greater height. Contact us not just for business, but we-care-2-listen too. Contact our friends here : www.wecare2listen.com who has published a book about their struggle with Adultery, and victory in Reconciliation.